Today one of my students told me that I look like a wild jungle fairy. Maybe it's the blouse? I just thought about it, giggled, thanked him and went about passing out the papers. Personally, I don't really picture fairies wearing blazers...my students crack me up. I've been looking forward to wearing this outfit since gathering my clothes for the 30 for 30. I made my yellow skirt last month, but this is the first time I've worn it. I am really happy with how it turned out. It's bright, cheery and versatile. p.s. Today was blazer day over at EBEW. only the business fairies wear blazers. It is such a happy outfit. Love the skirt! Oh how I love student comments. You never know where their ideas come from. And I agree with Amber - what a happy, fun outfit! I adore your outfit, it's just so fun, and colourful. great style! You made the skirt? Impressive!! oh my! you are too cute! love the skirt! I love the skirt. So cute. Make me a yellow skirt!!! You look great and so springy in all of these colors. The color of that skirt is fantastic! 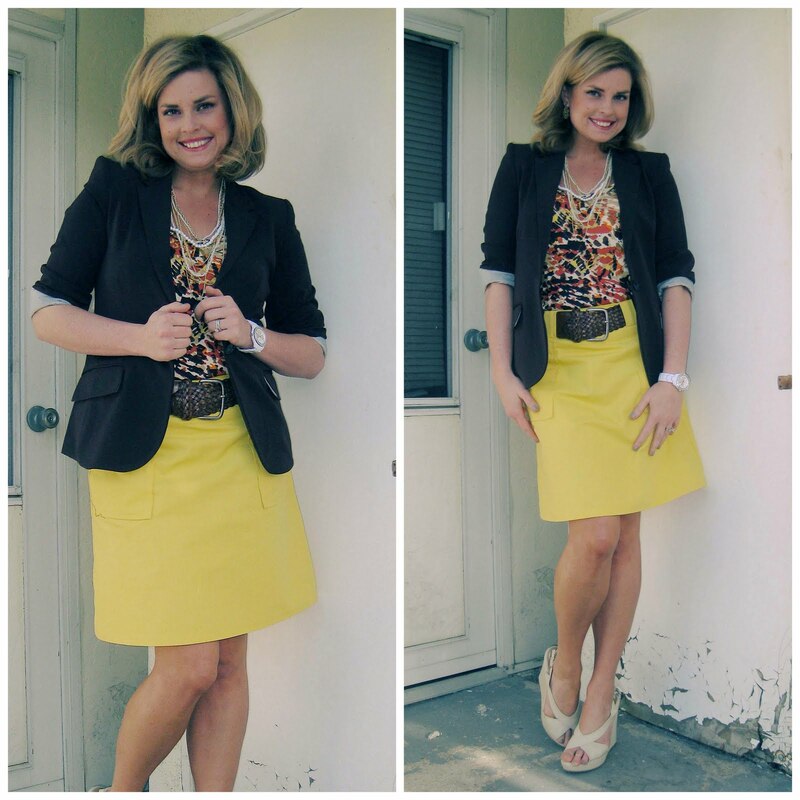 Love the yellow skirt! And very jealous that you can be outside, bare legs & sandals! I love bright tights, but over winter! professional looking but still looking good!! !